The Warzone REQ Bundle is a one-time-only purchasable offer for Halo 5: Guardians. Once acquired, there is no ability to purchase a second bundle in-game, in the Xbox Store, or on Xbox.com. 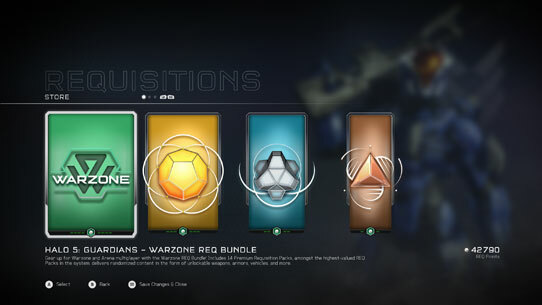 However, we have identified several fans who have attempted to redeem token codes for the Warzone REQ Bundle after the offer was already purchased on their account. These codes could have been acquired through either promotional bundles or purchase at retail. While this is a small number of fans, we want to honor their purchase and commitment to Halo 5: Guardians. We are doing a one-time-only distribution of 14 Warzone Premium Packs to any players who have purchased the Warzone REQ Bundle and then subsequently redeemed a code for another bundle between the dates of October 27 and January 25. Those who have been affected by this are being notified via an Xbox Live system message. This will happen once only; any token codes applied to an account that previously purchased the Warzone REQ Bundle after January 25 will be lost.